In a recent post at Three Pipe Problem, I read of the controversy currently raging in Italy over the authenticity of a Raphael painting known as the Vision of Ezekiel now in the Pitti Palace in Florence. The question of whether this painting was by Raphael or one of his associates was of lesser interest, but as I read on another question came to mind. At a later period, our artist painted a small picture, which is now at Bologna, in the possession of the Count Vincenzo Ercolani. The subject of this work is Christ enthroned amid the clouds, after the manner in which Jupiter is so frequently depicted. But the Saviour is surrounded by the four Evangelists, as described in the Book of Ezekiel: one in the form of a man, that is to say; another in that of a lion; the third as an eagle; and the fourth as an ox. The earth beneath exhibits a small landscape, and this work, in its minuteness—all the figures being very small—is no less beautiful than are the others in their grandeur of extent. Between these animals something could be seen like flaming brands or torches, darting between the animals; the fire flashed light, and lightning streaked from the fire. And the creatures ran to and from like thunderbolts. My name is John…I was on the island of Patmos for having preached God’s word and witnessed for Jesus; it was the Lord’s day and the Spirit possessed me, and I heard a voice behind me, shouting like a trumpet, “Write down all that you see in a book…"
In the Vision of Ezekiel the small figure on the left receiving the vision must then be identified not as Ezekiel but John, exiled on the isle of Patmos. It is hard to tell but he seems to be on an island facing a broad expanse of sea rather than in a crowd of people at the bank of the river Chebar. Some scholars have argued that there is a companion piece to the Vision of Ezekiel that did not find its way back to Italy after the fall of Napoleon. In his study of Raphael Jean-Pierre Cuzin discussed a small oil on panel of the Holy Family. The kinship in style and execution of the Small Holy Family and the Vision of Ezekiel in the Pitti Palace at Florence, which have the same dimensions is striking: the rounded, thick-set bodies, strongly modeled by black shadows and lively touches of light, and the vigorous impasto execution, invite one to see an identical hand in both pictures—that of Penni, for Konrad Oberhuber. Others have more often thought of Giulio Romano. The Vision of Ezekiel, unlike the neglected picture in the Louvre, counts among Raphael’s celebrated works; it is identified with a picture described by Vasari at Bologna in the house of Count Ercolani. Whilst the primary aim of Dr. DeStefano's piece was to review the Biblical source for the Vision of Ezekiel - the question of attribution is also strongly raised. It must be noted that both works are of similar size, on panels of approximately 40x30cms. 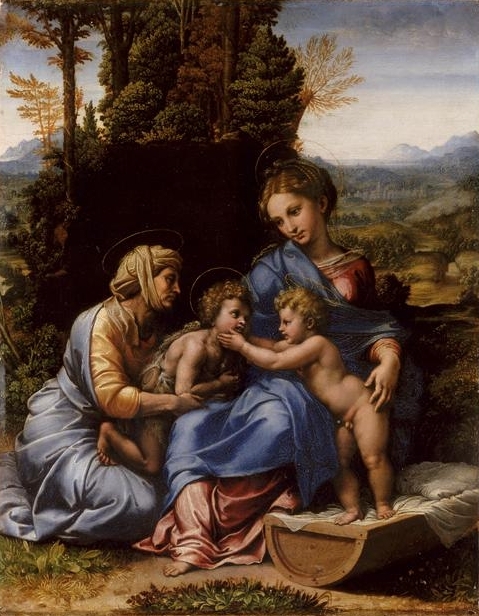 Following examination of the Louvre piece(*), the attribution of La Petite Sainte Famille is now firmly with Giulio Romano, whereas the Pitti Piece, less scientifically scrutinised than any of the Raphaels in Florence still has its traditional attribution, almost purely on the strength of Vasari's mention of it. As Dr. DeStefano has demonstrated, not only is Vasari's reading of the thematic source in need of review, but questions arise as to its correct attribution. With a circa 1518 date, it is of course likely this was produced by Romano under Raphael's guidance, possibly his design. The similarity of La Petite Sainte Famille to the Prado's famous Pearl are of course noted - which is generally agreed by scholars a Romano/Raphael collaboration. As more details of Roberto De Feo's investigation into the Vision of Ezekiel are released, perhaps more answers will be forthcoming. It is most definitely curious that two similarly sized paintings, with a unifying theme - after having been stolen by Napoleonic forces, now have separate attributions by virtue of which gallery they happen to be located in. -H. Niyazi. Vasari, G., Lavin, M.A(ed.) Lives of the Most Eminent Painters. Volume II. New York, 1967. p. 41. Cuzin, J.P. Raphael, His Life and Works. New Jersey. 1985. p. 226. Frank, you have put forth some interesting ideas about figure in the background as Saint John. I also think that Vasari's identification as the figure of Christ (but with imagery similar to that of God the Father) isn't problematic at all, given the nature of the Trinity. You make a good point. The youthful body and light brown beard could be a reference to "I and the Father are One." @M/Frank - The nature of the Trinity does not explain some key questions about this piece. It is a simple fact that Old Testament images were less prevalent at this point in the 16th Century visual tradition. Less so in the case of Raphael and his School - particularly for a private commission. Michelangelo's Sistine Frescos were notable for many reasons, one of them was that they re-introduced many Old Testament themes into the visual tradition in Italian painting. Given Michelangelo's theological disposition, and his affinity with the teachings of Savonarola, this makes sense. Can we say the same for Raphael? He painted some Old Testament subjects for the Stanza della Segnatura, such as an Adam and Eve scene and The Expulsion of Heliodorus, this being done to parallel the exploits of Pope Julius II. Did Vasari visit Bologna and sight these works, or was he working from a secondary source? In addition, some further details on the provenance of the Small Holy Family is required. Were both pieces taken by French forces at the same time, from the same location? This information would be revealing, but has been difficult to obtain. A technical vs stylistic comparison of Ezekiel and the Small Holy Family would better be able to delineate if they were created in a similar manner, with similar materials, which would go a long way to establish whether they were by the same artist.